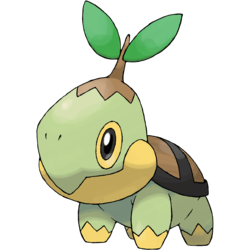 Turtwig in game: 4,896 Who? Important notice! Pokemon Turtwig is a fictional character of humans. 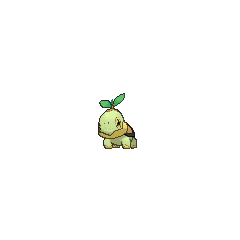 Turtwig (Japanese: ???? Naetle) is a Grass-type Pokémon introduced in Generation IV. Ash obtained his Turtwig in Gettin' Twiggy With It!. It eventually evolved in Aiding the Enemy!, and again in The Fleeing Tower of Sunyshore!. Paul's starter Pokémon was a Turtwig, which has fully evolved into a Torterra. It appeared as a Turtwig in a flashback with Paul in A Pyramiding Rage! where it was watching Reggie battle Brandon. Turtwig made its debut appearance in Following a Maiden Voyage. It was a starter Pokémon Professor Rowan was giving out. It had a relaxing nature and it was eating almost the whole time and was oblivious to the fight going on between Chimchar and Piplup. However, it appeared to be afraid of Rowan, as seen when he glared at it and it panicked. 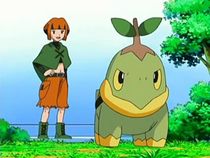 A Turtwig owned by Rowan also appears in SS024. 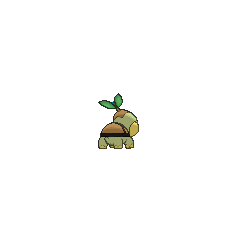 The Gym Leader Gardenia has a Turtwig that first appeared in The Grass-Type is Always Greener!. It was used in the Gym battle against Ash in The Grass Menagerie. It defeated Staravia, but lost to Ash's Turtwig. Another Turtwig appeared in Dawn of a New Era!. It was under the ownership of a Trainer at the Pokémon Center. 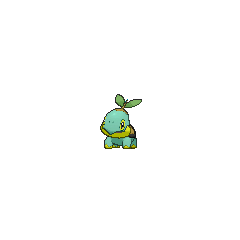 Another Turtwig also appeared in Classroom Training!. A young boy was using it at the Trainers' School to battle a Chimchar. Multiple Turtwig appeared in Alexa's magazine in The Journalist from Another Region! alongside Grotle and Torterra. 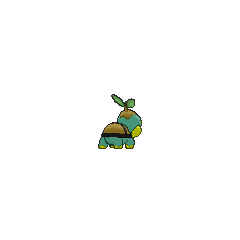 A Turtwig appeared as a plush toy in A Jolting Switcheroo!. Diamond owns a Turtwig, which he nicknamed "Tru" in Pokémon Adventures, which evolved into a Grotle simultaneously with Chimler (Pearl's Chimchar), and Platinum's Piplup in Eterna City, and then again in Veilstone City into a Torterra along with Chimler. Turtwig is Jun's starter Pokémon in Pokémon Diamond and Pearl Adventure!. It was partnered with Hareta's Piplup to battle Mars's Zubat and Purugly. It later appeared as a Torterra, having evolved from Grotle earlier. Gardenia also has a Turtwig which was used in the Gym Battle against Hareta's Misdreavus. 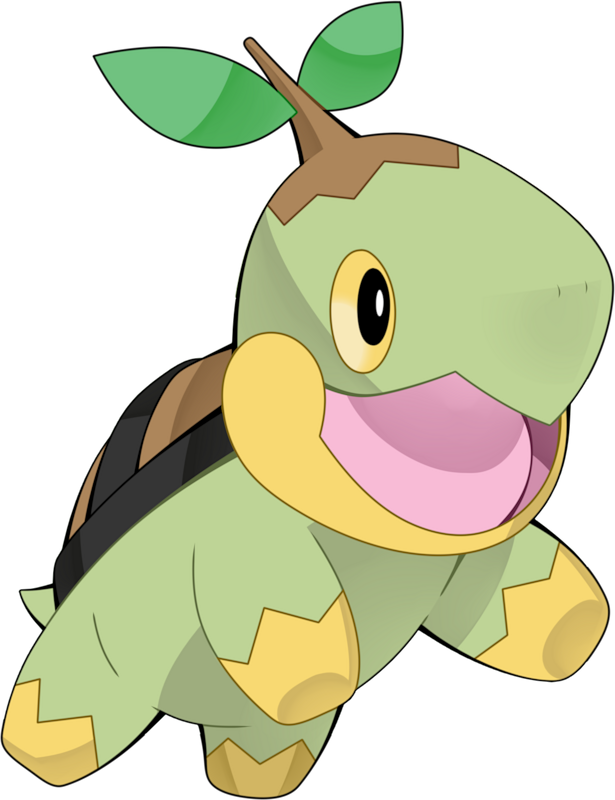 Turtwig is the heaviest of the basic forms of all of the starter Pokémon. It also has the lowest base Speed out of all starter Pokémon. Naetle is a combination of ? nae (sprout) and turtle. Mandarin Chinese ??? / ??? Caomiáogui Literally "Grass sprout turtle"